In our previous post we discussed one of the secrets to making it through the fall and winter seasons without getting sick — developing the cold-and-flu-fighting capacity of your immune system! What most folks don’t realize is we have a tremendous influence over the strength of our immune system and our body’s ability to fight off foreign germs, outside invaders, and seasonal bugs. Whether it’s creating nutritional balance, developing our physical fitness, or incorporating effective stress management techniques into our day there are all kinds of steps we can take to develop our Immune Power and increase our resistance to disease. In this article we are going to take this subject one step further and explore the top 5 foods to eat and the top 5 foods to avoid to prevent the cold and flu. For additional information on how to build your immunity against the cold and the flu, check out our Check Out our Seasonal Cleanse Guide. So what is it in particular about these foods that can get you into trouble? The problem with eggs, dairy products, refined carbohydrates, and refined sugars is twofold. First off, they can be very mucous forming and have a way of clogging up your upper respiratory system. Unfortunately, when your upper respiratory passages get backed up, it creates an environment for bacteria and viruses to take hold and spread. This puts your immune system at a tremendous disadvantage and makes you much more vulnerable to the cold and flu. I’ve also observed that these foods have a way of impairing the lymph system and weakening your immune response. In this manner, these 5 foods can increase your risk for catching a virus and prolong the amount of time that it takes to recover from the cold or flu. Just as there are certain foods to avoid around the change of the seasons, there are also foods that you can emphasize that will boost your immune system and help prevent upper respiratory infections. For example, I’ve found that fresh-squeezed citrus juices — such as fresh squeezed orange juice and fresh squeezed grapefruit juice — are very effective in helping to prevent and recover from a cold or flu. What is it that makes citrus fruits and their juices so special? What I’ve learned over the years is that citrus fruits have a detergent action, loosening up and preventing excess mucus build-up in the upper respiratory passages (the exact opposite effect of mucous forming milk, eggs, and dairy). This makes it much more difficult for viruses to take hold and spread. In addition, citrus fruits are full of vitamin C and other immune boosting compounds that build your body’s cold-and-flu-fighting capacity. With that in mind, let’s take a look at the top 5 foods you can eat to protect your upper respiratory system from seasonal viruses. You’ll notice that in addition to the citrus fruits and juices, we’ve also included romaine lettuce in our list. Your leafy greens, such as romaine lettuce, are a staple to an immune boosting nutritional program. They are a great source of vitamin C, vitamin A, and other phytonutrients that strengthen immune function and increase your resistance to the cold and flu. Eat Your Citrus Fruits & Leafy Greens Fresh, Whole, & Alive! In doing so you’ll be going a long way in protecting your upper respiratory passages, boosting your immune system, and fending off the seasonal cold and flu. Making it through the fall and winter season without coming down with the cold or flu can sometimes be a challenge — but it doesn’t have to be! Fortunately, there’s a lot you can do to protect yourself! In this article we’re going to explore the most important steps you can take to prevent the flu and common cold. But first, let’s test your knowledge. 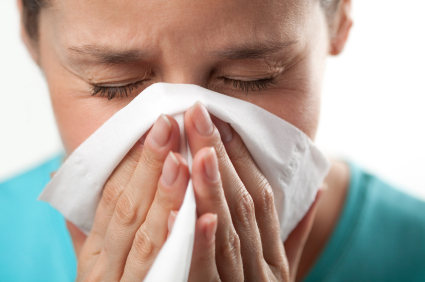 Do you know what your primary defense mechanism is in protecting yourself from this season’s cold and flu? Is it washing your hands frequently and trying not to come into contact with any germs? Is it getting your flu shot or annual vaccine? Or is it naturally boosting the cold-and-flu-fighting capacity of your immune system through nutrition, physical fitness, and stress reduction techniques? While all of these factors play their own specific role, the idea behind this question is to get you thinking about the primary actions you can take to successfully prevent the cold and flu. Let’s take a closer look at the different options. Is Washing Your Hands Your Primary Defense Mechanism Against the Cold & Flu? When it comes to seasonal viruses, conventional wisdom teaches us that we need to wash our hands and try not to “catch” the cold or flu from co-workers or family members that might be infected. But is avoiding germs really our best defense mechanism against seasonal viruses? What I find interesting is this approach to preventing the cold and flu originated and has been perpetuated by the “germ theory” of disease. What exactly is the germ theory of disease? The germ theory of disease states that the cause of an illness, such as the cold or the flu, is the direct result of being exposed to a germ or virus. Based on this logic, the best thing you can do to avoid getting the flu is to try and avoid any contact with germs. Unfortunately, while this is the prevailing advice that makes its way through the media and most doctors’ offices, it’s a bit misguided. It doesn’t tell the whole story. It’s not our primary defense mechanism for fending off the cold and flu and does not necessarily protect us from getting sick. The Host: Your body, which is protected by your immune system — your body’s internal military that is constantly at work to identify, neutralize, and destroy any foreign invaders. The reason the germ-theory of disease is misleading is it puts all of the emphasis on the agent (the germ) and minimizes the indispensable role that the host (your immune system) plays in the process of fending off outside intruders. Think about it for a moment. Have you ever noticed that some people come down with the flu that is going around in the office whereas others don’t? Is it because only a few people came into contact with the germ or virus? The truth is we come into contact with invisible germs and viruses all the time. What ultimately determines whether or not we get sick — and how long we stay sick if we are indeed infected — is the strength of our immune system. Sure, the agent (the germ or virus) has to be present for us to get sick, but more importantly, our immune response is typically the deciding factor in determining whether or not we come down with the cold or flu. The good news is there’s a lot we can do to fortify our immune function and build our cold-and-flu-fighting capacity. Unfortunately, there’s also a lot we can do to compromise our body’s immune response. For example, when we’re over-stressed and eating the wrong foods, it causes our body and our immune system to tilt, and increases our susceptibility to the cold and flu. Alternatively, when we create a lifestyle of nutritional and emotional balance, it’s empowering to our immune system and increases our resistance to germs, viruses, and all kinds of disease. Another way I like to explain this to my patients is it’s important to build up your body’s internal military when heading into the fall and winter seasons. Why is that? Because this is the time of year that the cold and flu are most likely to be on the attack. No matter how vigilant you are about washing your hands and avoiding germs, odds are you are going to be exposed multiple times to various viruses. With this in mind, the most important thing you can do to protect yourself is to build up your immune system and develop your Immune Power — your body’s ability to naturally fight off and destroy these outside intruders. So how do you go about building Immune Power? How do you develop the strength of your internal military to defend yourself from getting sick? Let’s take a look at a few important strategies. Eating Smart Foods, developing the habit of physical fitness, strengthening your cardio-respiratory health, and effectively managing stress all come into play in creating the Immune Power necessary to protect your body from the seasonal flu and cold. From a nutritional standpoint, emphasizing whole, living, high fiber, low saturated fat, phytonutrient and antioxidant rich foods — such as fresh fruits, vegetables, lentils, beans, and whole grains — are a great way to build your immune system. There are also very specific foods, such as citrus fruits and leafy green vegetables, that play a particularly important role in protecting your upper respiratory tract from seasonal bugs. (for more information, click here to learn the 5 Foods to Eat and the 5 Foods to Avoid to Prevent the Cold & Flu). Meanwhile, it’s been well documented that regular exercise decreases your risk for upper respiratory infections. With that in mind, make sure to stay consistent with your exercise routine and make a renewed commitment to your physical fitness and cardio-pulmonary health. Finally, taking steps to manage stress and emotional tension is another way to protect against the cold, the flu, and stress-related illness. How so? It’s well documented that stress-related hormones can suppress immune function and make you more susceptible to getting sick. Therefore, by incorporating stress reduction techniques into your morning and evening — whether it’s exercise, meditation, simple breathing drills, or mind-body disciplines such as yoga — you can take an active role in protecting your immune system from the emotional stress and mental strain of day-to-day living. With all that said, is it still helpful to wash your hands and cover your mouth while sneezing to keep a virus from spreading? Absolutely — but it’s not the primary step that you need to take to protect yourself and others. First things first; you need to make sure you are prepared to fend off germs and viruses from the inside out. It’s important to make sure that you are taking steps to build, fortify, and protect your Immune Power. Is the Flu Shot an Effective Means for Fighting off the Flu? What about getting a flu shot? Is that an effective means for preventing the flu? Unfortunately, getting a flu shot does not necessarily protect you from coming down with the flu. It’s important to note that developing a flu shot is an imperfect science. Every year they have to make an educated guess as to which influenza strain they believe will be most prevalent 9 months in the future. Sometimes they predict well and sometimes they don’t. Even when they do predict well, there are numerous other viruses that circulate in any given year that the flu shot does not protect against. Interestingly enough, a large study that was just completed analyzing the efficacy of the flu shot showed that the flu vaccine only reduced the incidence of the flu in 1.5 people out of every 100 (The Lancet, Efficacy and effectiveness of influenza vaccines: a systematic review and meta-analysis). At the end of the day, the only way to put yourself at the lowest possible risk for all strains of flu viruses and seasonal colds is by strengthening your body’s natural defense mechanisms. In other words, by building up your immune system and developing your Immune Power — through nutrition, exercise, and stress management — you can tap into your body’s infinite wisdom and potential to protect itself against outside germs and viruses. For those interested in learning more, make sure to check back for more specific immune-boosting strategies to prevent the cold and flu! Making a point to eat fresh, whole, living fruit on a daily basis is one of the cornerstones to creating nutritional balance and staying strong, energized, and balanced–mentally, physically, and immunologically. In the last couple weeks we talked about the nutritional, therapeutic, and emotional value of The King of Citrus & The Queen of Citrus. This week we’re going to focus on the pineapple, and how it can play an important role in revitalizing your mind, healing the body, and boosting your mood. Let’s take a closer look. Native to South America and a staple of Hawaiian and other South Pacific cuisines, the pineapple has a playful effect on moods. It’s a vibrant, jubilant fruit, capable of creating upbeat, cheerful food swings. Like a tropical vacation, pineapples have a way of rejuvenating the mind and body. While the pineapple isn’t technically a citrus fruit, I like to consider it a close relative. Why is that? When you take a look at the nutritional profile and therapeutic value–not to mention the fact that it combines well with other citrus fruits–there are all kinds of similarities. For example, like all citrus fruits, pineapples act as a powerful cleanser of the bloodstream. They are rich in minerals, vitamins, and antioxidants that fight off accelerated aging and degenerative illness such as cancer, and are also loaded with phytonutrients that strengthen the immune system and increase your resistance to disease. In addition, pineapples are very effective in loosening up excess mucus that put you at increased risk for the cold, the flu, and upper respiratory infections–just like oranges, grapefruits, and other citrus fruits! In addition to all of these health benefits, the pineapple has a secret weapon that distinguishes it amongst the other “citrus fruits” in the plant kingdom. More specifically, the pineapple is uniquely endowed with a miracle phytonutrient called bromelain. Bromelain is a protein-digesting enzyme complex of the fruit, which resembles the enzymes in the sap of fig and papaya trees. I mention this because in the same way sap heals a tree, so, too, does bromelain heal the body! 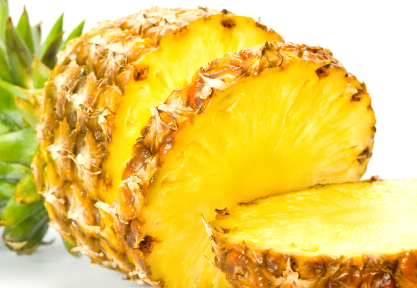 In addition to treating indigestion and aiding in the breakdown of protein, bromelain has the notable ability to mend sports injuries, ease arthritic pain, and reduce inflammation in the body. In fact, bromelain is prescribed by plastic and general surgeons, post-operatively, to reduce swelling of tissues and to prevent edema. It’s used to inhibit blood platelet aggregation and accelerate wound healing. I’ve also found that pineapple encourages an increase in hemoglobin and can be a valuable fruit for anyone suffering from anemia. Fragrance is the key to determining freshness: A sweet aroma indicates that the fruit is mature. Look for bright green tops, securely attached crowns, and choose the deepest yellow-orange pineapples. Try to pull out one of the spines–if the pineapple is ripe, it will come out easily. The fruit should feel dry and heavy for its size, and should be free of dark, decayed spots. 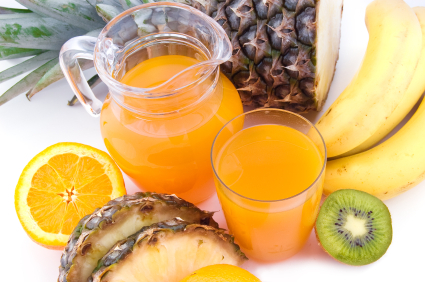 Like all fruits, it’s best to consume pineapples and pineapple juice fresh and raw. Serve pineapple fresh with other citrus fruits such as oranges and grapefruits. In addition, pineapple with strawberry and banana, pineapple with pink grapefruit and banana, or pineapple with papaya and banana all make excellent fruit salads. Keep in mind, however, that pineapple does not combine well with melons or grapes. Finally, give granola a jolt with pineapple chunks. ***This article is not intended to treat or diagnose any type of health condition or disease. Any nutritional considerations for any health complication should be discussed with your physician or healthcare provider.